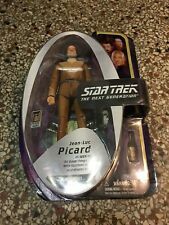 THIS ITEM IS A MUST HAVE FOR ANY STAR TREK COLLECTOR / FAN / ENTHUSIAST! Sealed, card has faint wear and price sticker. 9" CONSTABLE ODO. 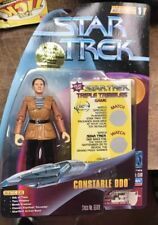 STAR TREK Warp Series 1. CALIFORNIA RESIDENTS ADD 8.0 %. He is complete with all part and is in excellent condition with tight joints and litle to no play wear. These were produced by Playmates Toys from the early to mid 1990's. Star Trek Constable Odo w. Soft Tribbles. New, unopened, has shelf wear. Please see pictures for condition. Be sure to ask questions before bidding. Thanks for looking. Please check out our other listings. 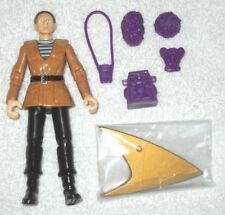 Star Trek Constable Odo TT. ALL CONTENTS IN NEW CONDITION. Condition: Unused. Sticker residue on front. NO EXCEPTIONS. We have provided the best quality and quantity of image that we are capable of providing. NO OTHERS ARE AVAILABLE. Character: Constable Odo. Star Trek The Next Generation. Starfleet Action Base. Gear Included Two Tribbles. Serialized Warp Factor Series #1. Minor scuffing on the plastic due to storage andminor crease on front upper right. 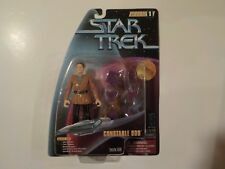 Star Trek CONSTABLE ODO Figure Deep Space Nine 9" Playmates Warp Factor Series 1. Condition is New. Shipped with USPS First Class Package. Trending at C $16.63eBay determines this price through a machine-learned model of the product's sale prices within the last 90 days. 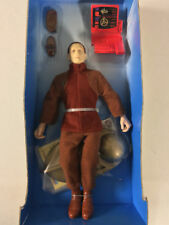 Star Trek Serialized Warp Factor Series 1 Constable Odo. The box is in Excellent Solid Condition. CONSTABLE ODO. SERIALIZED WARP FACTOR SERIES 1. Does not effect the display ability so my loss is yours to treasure. This is a very good collectible piece for any collection or just for display. I used to love watching the old Star Trek series on TV and I especially liked all the movies with William Shatner & the crew. 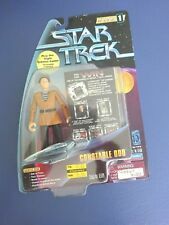 1997 Playmates Star Trek Constable ODO Action Figure Loose-L-48. Condition is Used. Check pictures out. CONSTABLE ODO. SERIALIZED WARP FACTOR SERIES #1. STARFLEET ACTION BASE. TWO TRIBBLES. BOMB SCANNER. CLASSIC STARFLEET TRICORDER. 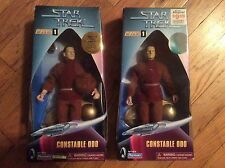 Star Trek Warp Factor Series 1 Constable Odo And Kirk. Condition is New. Shipped with USPS Priority Mail. Constable Odo. 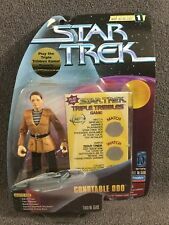 PLAYMATES STAR TREK Warp Factor Seires 1. ASST 65100 - 65109. Star Trek Warp Factor Series 2.5cm x 23cm Constable Odo. Best Price. Add to Favourites. Kitchen, Dining, Bar. Other Information: na. Health & Beauty. From Playmates. Age Range: 5-9 years. Add to Favourites. Other Information: 65109. Health & Beauty.